One of the core tenants of creating an effective museum exhibit is to know your audience and, perhaps more importantly, to know the market within which your audience lives. It is estimated that over 64% of Americans watch NFL football and over 54% watch college football. In Oxford, MS that percentage must be closer to 100%. Perhaps this explains why The University of Mississippi [Art] Museum director, Robert Saarnio, wasted little time contacting Bloomingdale’s upon learning of their Fashion Touchdown auction, benefiting the NFL Foundation. Saarnio first read about the project in the New York Times, which described a rare partnership between leading fashion designers and a major athletic association. He had an idea. He really wasn’t sure if it would work. He expected to hear nothing. But Saarnio lives by the philosophy that “life is too short to be timid.” So, he wasted little time contacting Anne Keeting, Senior Vice President of Public Relations at Bloomingdale’s. His courage paid off; Keeting responded immediately with resounding exuberance. 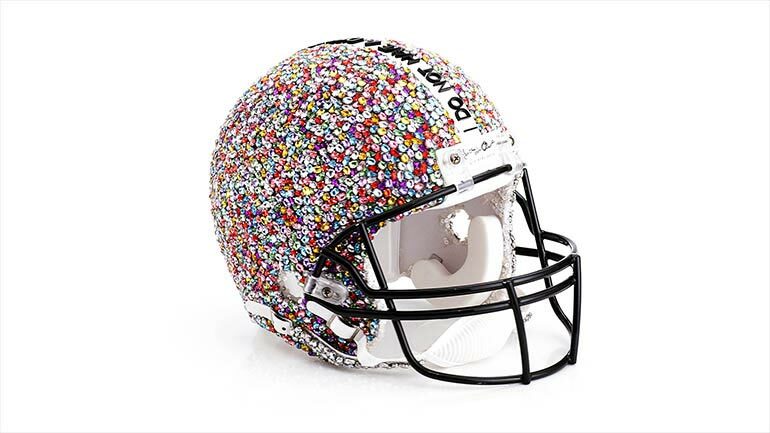 Fashion Touchdown was an artistic collaboration between Bloomingdale’s, the Council of Fashion Designers of America (CFDA), and the NFL Foundation to honor Super Bowl XLVIII, the first ever played in New York City. 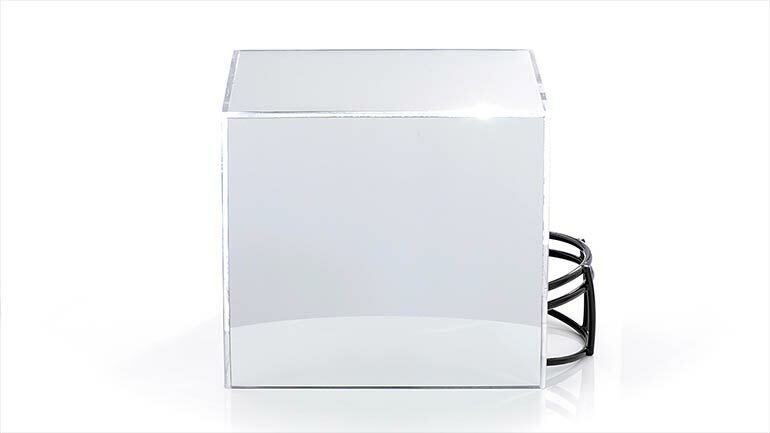 Forty-eight solid white football helmets were creatively decorated by an impressive list of designers including Vince Camuto, Diane Von Furstenberg, and Donna Karan. The helmets were then auctioned during an online charity event that raised $73,000. 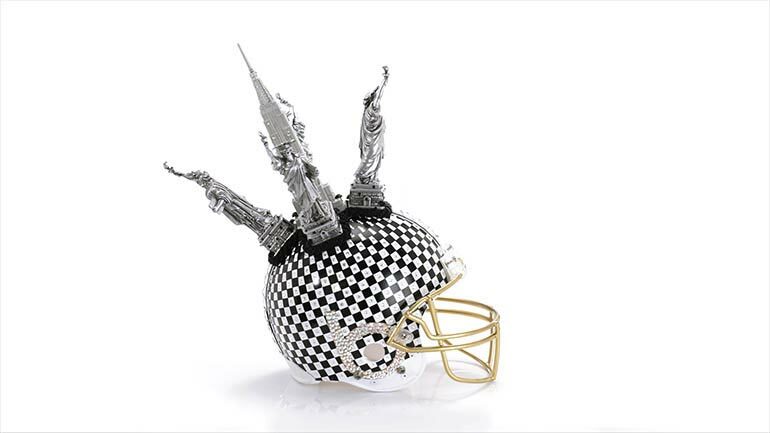 Hidden within the designer football helmets Saarnio saw an art exhibition. The purpose of his email to Keeting was to request the images and helmets for display in the University Museum in Oxford, MS. According to Keeting, Bloomingdale’s had not yet received such a request. She replied that he could use the professional images and the promotional video but that he could only obtain helmets by purchases them through the auction. With only 72 hours before the auction’s deadline Saarnio scrambled to procure three helmets, the last coming in the final seconds after a long battle with another bidder. Overall, the exhibit is simple; 48 framed images on the wall, 3 helmets on pedestals, and 1 looping video. The format could benefit from adding a short introductory panel describing the CFDA’s previous involvement within the sports market, or specifically the NFL. Additionally, a description of the designer’s selection criteria and the process of creating their art would provide a more complex understanding for the viewer. However, within the exhibition’s simplicity lies a clean slate from which to decipher an complex set of messages: a marriage of fashion’s soft side, football’s hard side, a unique avenue for artistic expression, and, in some cases, an outlet for cultural commentary. 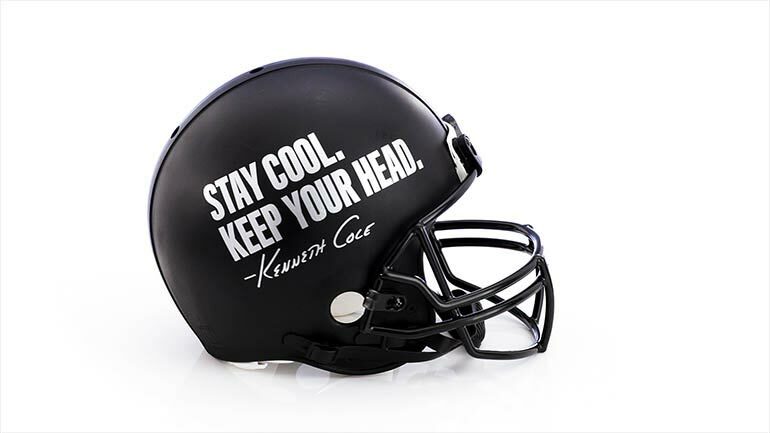 Kenneth Cole used his art to focus on problems surrounding head injuries in the NFL. Gregory Rogan took a more theoretical approach to thinking outside the box. However, a majority of the designers chose to focus on the alarming juxtaposition of the feminine meeting the masculine in an ironic twist on gender. The clean lines and open space allows each image to speak for itself, each containing more entangled messages than one can internalize in a single visit. I discovered this art exhibition on October 21st, right in the middle of football season, looking perfectly at home. Everything about it seemed acceptable for any college football town. Yet it only showed on one campus. Despite the very large number of fans in America, exhibits pertaining to sports content rarely debut outside of athletic related museums. This is true of museums across the board: art, children’s, history, or even science. Saarnio’s ability to create and execute this idea in an art museum shows his tremendous insight and leadership for the museum’s surrounding community. Ole Miss Fans, football fanatics, and sport enthusiasts now feel more at home inside the gallery doors. The University Museum experienced improved attendance with a broadening of their audience, and the exhibition remained on display longer than anticipated because of its success. The exhibition also acted as the cornerstone to the Museum’s seasonal family kick off event. 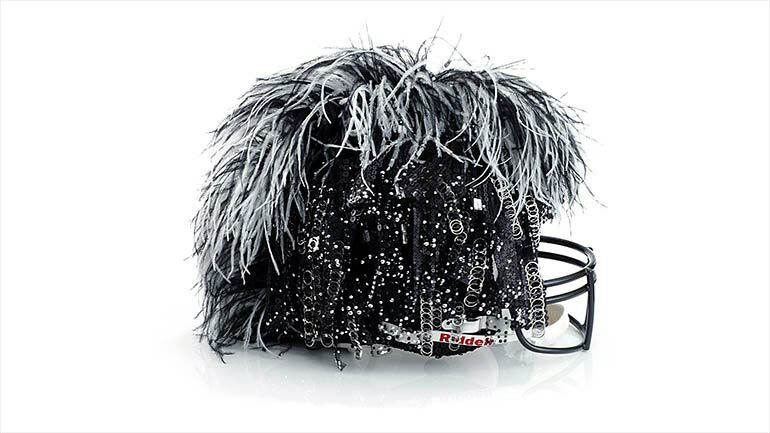 Children could design their own helmet using milk jug halves, pipe cleaners, and other embellishments. Families who arguably feel more at home tailgating in the Grove, poured into the galleries, celebrating the start of their favorite season in Oxford, football season. The success of this exhibition demonstrates that a rich cultural context within sports exhibits can draw not only those who regularly attend the museum but in fact attract visitors outside their standard audience. Arguably, all museums can mine their audience for sports fans. However, if sports topics are going to grace the galleries of non-sports museums, directors and interpreters need to think outside the standard shaped pallet. On Museum ID Robert Thorpe and Lucy Shaw explain, “Adaptive [museum] leaders need to reflect on their vision, values, impact, perceptions, behaviors and attitudes (including to risk) – if a leader is open and adaptive themselves, then people will follow.” From just one exhibition Saarino has expanded the Museum’s audience in an innovative and sophisticated way. It is clear, Saarnio is leading and the people are following. I can’t wait see what he does next, or which museum professionals follow his lead. How do you see sports interacting in museums with various disciplines? And how can sport museums expand their audiences by attracting the art, science, or history museum goer in innovative and sophisticated ways? And I urge you to expand on the depth of this artwork. What messages from the designers do you see hidden in the helmet’s designs? The Fashion Football exhibition will remain open through January 17, 2015 and can be viewed at the University Museum every Tuesday through Saturday 10am-6pm… including football Saturdays!